If you want a glowing and smooth complexion, then it is a must to prepare your own face masks and lotions that will get rid of the unsightly blackheads. Some doctors believe that blackheads are an early stage of acne, so they must be removed at regular intervals with these simple homemade treatments. Mix two egg whites and apply them on the face. Leave them to dry for 15 minutes then remove them easily. Your skin will be cleaner and brighter. Mix one teaspoon of apple cider vinegar with one teaspoon of clay and apply it on your clean skin. Let it dry for 15-20 minutes then remove it with a damp cotton pad or with a wet towel. Mix one teaspoon of lemon juice with one teaspoon of honey and apply this mask on your face mask. Massage gently then rinse with warm water. Mix one tablespoon of lime juice, one tablespoon of glycerin and one tablespoon of almond oil. Apply this lotion on the face and leave it on for 15 minutes. 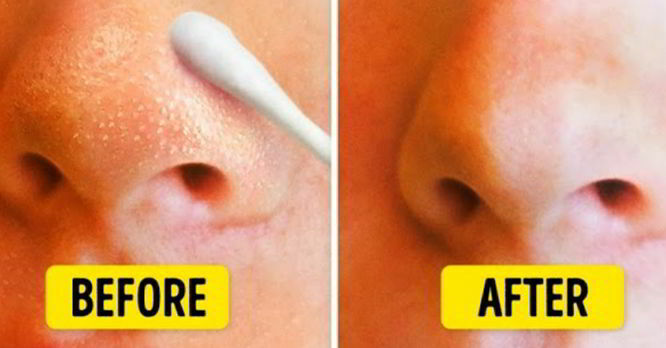 It will get rid of blackheads and will improve the stains on the face. First, rinse your face thoroughly with warm water to open the pores. Put 2 tablespoons of olive oil on a handkerchief, then add a little toothpaste (not gel). Massage the blackheads area and add toothpaste or olive oil if you have to. Wait 5 minutes, then rinse thoroughly.